Google is doing everything it can to photograph every last corner of the world for its Street View feature. But there are still some places its mapping fleet can't go, and you can fill in those holes yourself with your very own Street View camera kit. Imagine being able to give total strangers an interactive tour of your spacious private property, or even the inside of your home. That's exactly what this camera kit allows since it can be strapped to the roof of your car, or carried around in a backpack for use in more restrictive locales. 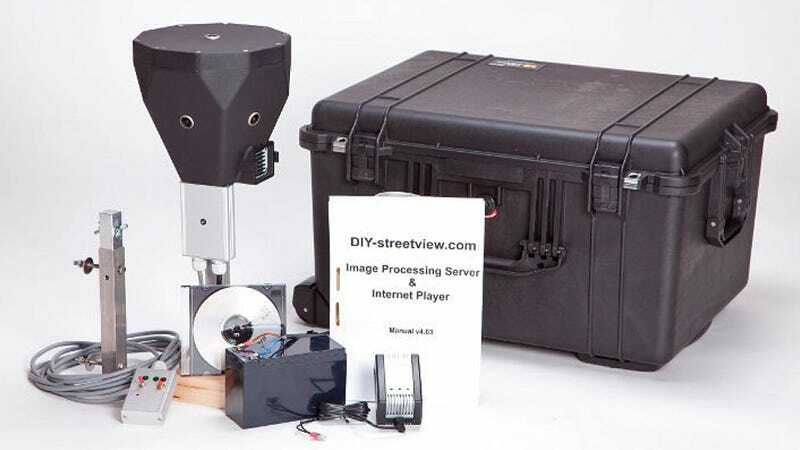 The heart of the kit is an elevated camera that uses six sensors to create a single 30 megapixel image that captures 90 percent of the world around it. Exposures are snapped every three seconds and are automatically leveled, stitched, and geo-tagged by an included image processing server software. Now unfortunately you can't upload your own Street View captures and have them rolled in to the Google Maps' database. But you can embed your own views onto your website with the same navigation functionality that Google Maps offers, which makes this setup an ideal tool for real estate agents who want to give clients a virtual tour of a home, or museums who want to open their collection to the entire world.